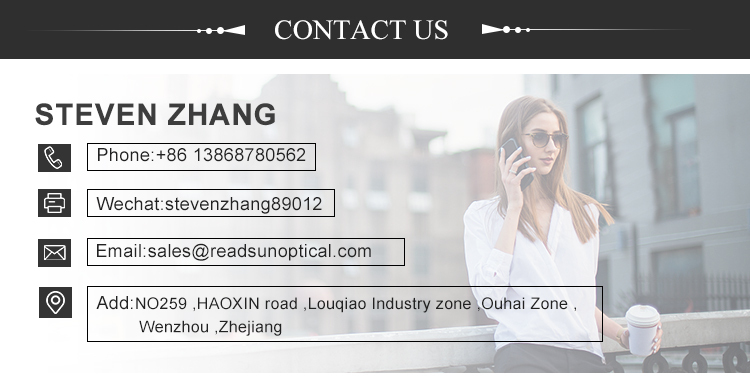 Readsun is an eyeglasses and eyewear products professional manufacturer with more than 10 years experience,mainly supply sunglasses, reading glasses and optical frames, have passed CE,FDA,REACH etc.certificates. We have strong ODM & OEM ability with design teams supply 500+ new original styles design each year . More than 10 years international top exihibition experience starting 2008, shows on Mido Italy, Silmo France, Newyork USA, Hongkong etc. each year. 1. What's your price and MOQ ? For small quantity,we suggest use express(such as Fedex,TNT,DHL,UPS).It could be freight collect or prepaid. For mass goods,our shippment could be by sea or by air,both OK for us.We can do FOB,CIF,DDP. We can accept T/T, Western union , once the order is confirmed, 30% of the total value as deposit,balance due to the goods are shipped out and original B/L is faxed for your reference.And other payment iterms available,too. 1).Coming many new designing each season. Good quality and suitable dilivery time. 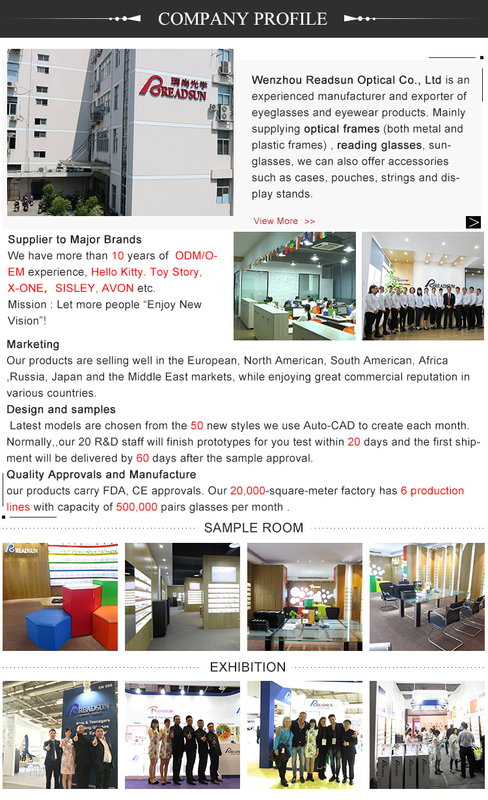 2).The quality service and experience in eyewear products are highly approved by our clients. 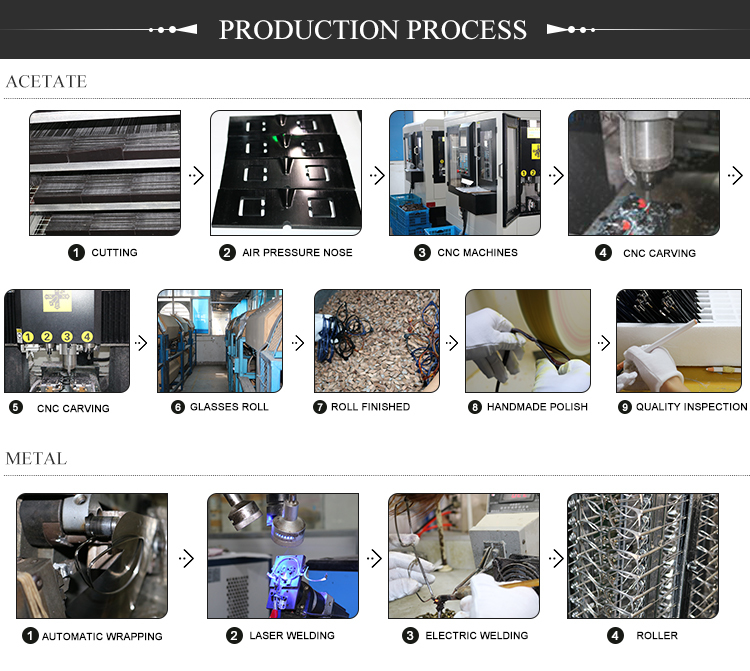 3).We have factories to well meet the delivery requirements. Delivery is on time and quality is well under control. 5.Can I order small quantity ? As for trial order,we will give you a lowest limited for quantity.Please contact with us in no hesitation. Making sample charge: will according to your design. Sample time: 3-5 days as normal,can ASAP. Sample making price will be refund or not according to the clients' order quantity.